Husqvarna Expands in McRae | Dublin Construction Co., Inc.
What a GREAT DAY in Telfair County, GA! Husqvarna Ground Breaking Ceremony was held April 14, 2016 for the construction of the New Press Operation. This new operation will create approximately 150-200 new jobs for McRae-Helena, Telfair County, Georgia and surrounding area. In attendance were 150+ guest (inclusive of elected officials, businesses, citizens, civic organizations, chamber directors, development authority directors, school administration/teachers/students) and 1000+ Husqvarna employees. TCES Treble Makers performed for the group. 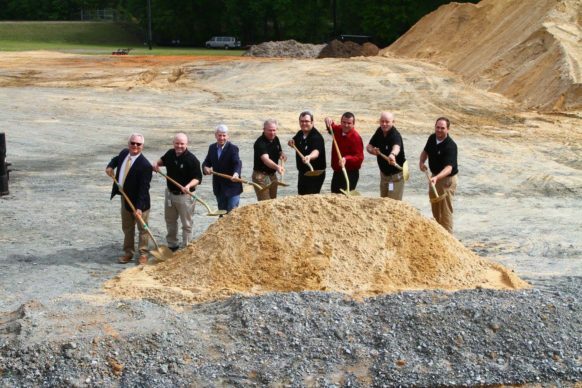 Ground breaking shovels were provided by Dublin Construction Company. Dublin Construction will be constructing the expansion to the existing facility.